the station is only a few minutes walking from the central Walther square! 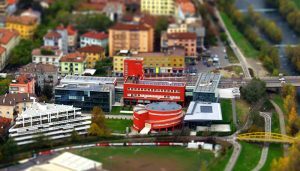 South Tyrol’s only airport is located in the southern outskirts of Bolzano/Bozen. Beyond South Tyrol the nearest international airports are in Innsbruck in the north and Verona in the south. The other airports Bergamo, Treviso, Venice and Munich are over 200 km away (or four hours by rail). Alto Adige Südtirol Bus offers airport shuttle services from/to South Tyrol. Daily trips to Munich Airport, Verona, Bergamo, Milan Linate or Milan Malpensa airports. No matter what time your flight departs, they will get you there on time. Click on the map for the institute location.